Derek Bailey's Company: Noble was involved in Company Weeks in 1987, 1989 and 1990, appeared with them at the Thessalonika Jazz Festival in 1985 and participated in a Company tour of Switzerland and Italy in 1987. He was also featured in the television series based on Derek Bailey's book, Improvisation, it's nature and practice in music, shown on UK Channel 4 in 1992. 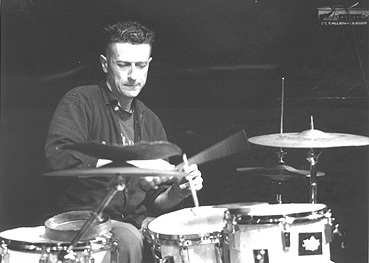 Steve Noble has regularly collaborated with The Bow Gamelan Ensemble (performance artist/musician Paul Burwell), with David Lester's Kino Club, and with a range of dancers and dance groups including Katie Duck and Group O, Steve Paxton, Alessandro Certini, Julian Hamilton, Kirsty Simpson, and Mal Pelo. He has composed original music for Alessandro Certini's Verso madre del turco (1988), Monserrat Llabres' L'hombre del'ocelot (1991), and Mal Pelo's Cancion por las pajaros (1993), Cancion per Bernabé (1997), and Orache (1998). Steve Noble runs the label Ping Pong Productions. 1987,	Live at Oscars,	Incus 52. Alex Maguire/Steve Noble. 1987,	Once,	Incus CD04. Company. 1989/1990,	Ya boo, reel & rumble,	Incus CD06. Steve Noble/Alex Ward. 1990,	Tumbala Casa! Trios vol. 1,	VOTP VOCA 907. With Billy Jenkins and Oren Marshall. 1995,	Flathead reunion,	Ping Pong 002. Noble/Williams/Marshall. 1996,	Bud moon,	Ping Pong 002. Noble/Marshall/Buckley. 1996,	Bent,	Extraplatte Ex 296-2. Franz Hautzinger Quartett. 1997,	Zap II,	DUNS Limited edition 004. Dunmall/Adams/Marshall/Sanders/Noble. 1997,	And,	Rectangle S/S2. Bailey/Thomas/Noble. 1997,	Improvisation,	MP97/ORF 15. Track by And on this concert CD. 1999,	Out of the past,	Ping Pong 004. Bailey/Noble. 1999,	Axis of cavity,	Bruce's Fingers BF40. Badland. 1999,	Spectral soprano,	Emanem 4204. Lol Coxhill; Steve Noble on two tracks. 1999,	Aniversario,	IBA CD-R IBA 2. Track on compilation CDR. 2000,	Homework,	GROB 317. School of Velocity. 2000,	London gigs,	Prominence PPRCD 4199. Two duos with Enzo Rocco. 2000,	False face society,	Incus CD47. Steve Noble/John Edwards/Alex Ward. 2000,	London Musicians' Collective ...the first 25 years,	LMC Res8.2CD/Res9.1CD. One track of Steve Noble's 4tet. 2000,	Zap III,	DUNS Limited edition 005. Dunmall/Gibbs/Adams/Marshall/Marsh/Noble. 2001,	Out to launch,	Emanem 4086. Lol Coxhill: The Unlaunched Orchestra. 2001,	Thirteen rectangles,	Bruce's Fingers BF43. SFQ. 2001?,	Barbarian, Incus CDR 5. And. 2002,	London duos and trios,	Intakt CD 081. Hans Koch. 2003,	Views of Mancini,	FMRCD263-0808. The Mancini Project. 2003,	The society of the spectacle,	Emanem 4120. Badland. 2003/2004,	Four compositions,	Red Toucan RT9326. SFQ. 2004,	The early years,	Ping Pong 003. Coxhill/Edwards/Noble. 2003,	Help point,	Copepod POD02. Alex Ward/Luke Barlow/Simon Fell/Steve Noble. 2008,	Deadeye tricksters,	Bo'Weavil Weavil 30CD. NEW [Steve Noble/John Edwards/Alex Ward]. 2008/09,	Sinister heights,	Remote Viewers RV6/7. The Remote Viewers. 2009,	NEWtoons,	Bo'Weavil Sidra LP01. NEW [Steve Noble/John Edwards/Alex Ward]. 2010,	...the worse the better,	OTOROKU ROKU001. Brötzmann/Edwards/Noble. 2011,	Prediction and warning,	Fataka 6. Ikue Mori/Steve Noble. 2012,	The Founder effect III,	Treader TRD018. Thomas/Noble. 2013,	I am here where are you,	Trost TR122. Brötzmann/Noble. 2013,	Mental shake,	OTOROKU ROKU010. Brötzmann/Adasiewicz/Edwards/Noble. 2013,	Fractions,	No Business Records NBLP83. Stefan Keune/Dominic Lash/Steve Noble. 2014,	Night in Europe,	No Business Records NBCD78. Martin Küchen/Johan Berthling/Steve Noble. 2015,	PEN, Dropa Disc #004. Parker/Edwards/Noble.